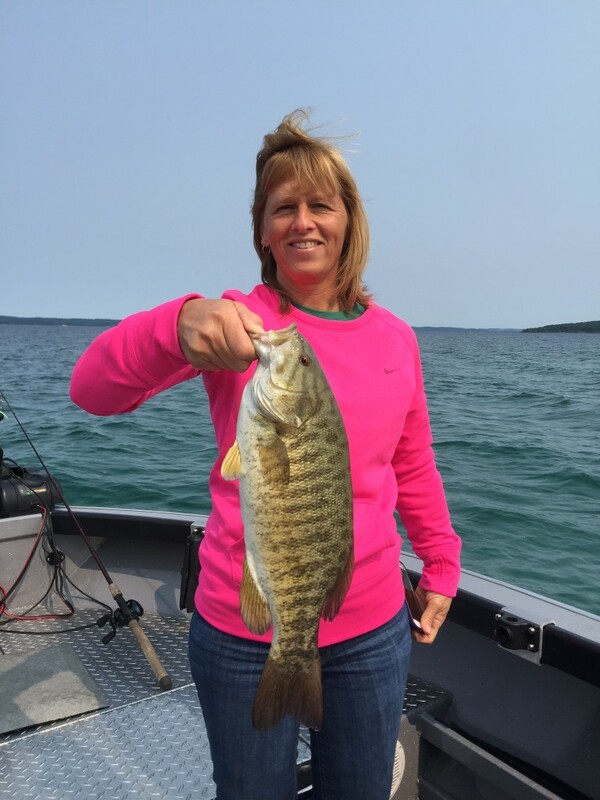 August is a great month to fish here in Northern Michigan because with the summer’s heat come high expectations and anticipation for what lies later in the month. August has fish down deep now and anglers fishing for most varieties of fish would do well to concentrate efforts mostly deep. Platte Bay: Fishing along the reef separating West and East Platte Bay can be tricky, especially for lake trout. Fishing the deep waters of West Bay, however, can be much more productive for king salmon when trolled higher in the water column. Smaller lake trout will be down close to bottom in 100-120, but the big ones seemed to have mostly moved down to 150 plus feet. As August continues, salmon move into both of Platte’s Bays, especially East Bay. Coho salmon are the big draw here, and expectations are that fishing will be better than it was last year. As fish congregate in the deep waters staging to run up the Platte River, the early morning bite and last light bite in the evening are the critical times to be out on the water when targeting salmon. Vertical jigging for salmon is about as explosive a technique as one can ask for, and late August is when we can do just this. Large jigging spoons anywhere from an ounce to even 3 ounces all get bites from both coho salmon as well as king salmon. The key to vertical jigging in waters ranging from 60-120 feet is to use a good sonar unit to locate break lines and underwater contours that hold fish At Sport Fish Michigan, we use our Humminbird Onix to watch fish chase jigs, and are often able to trigger bites from curious salmon just by knowing how to watch our jig, see the fish and adjust appropriately. Grand Traverse Bay: Salmon activity picks up as the month goes along, and both West and East Grand Traverse Bays will draw not only salmon, but salmon anglers. For West bay, “The Hole” is the community spot just adjacent to the Boardman River mouth. This is a deep hole that king salmon and lake trout love. This year’s alewives that are in both bays are big, and this means that there is plenty of food to fatten up this year’s salmon. For East Bay, the south bank and along the southwest corner is where most salmon anglers start looking for fish. The evening bite can be surprisingly good as well, and these are fantastic trips for a family to enjoy. A picnic supper right on the boat, watching the sunset on a nice August evening as the boat trolls along is tough to beat, especially when the salmon start to light up the lines right at dusk. We have high expectations for doing well out on the water, and are anticipating drag screaming runs from the salmon that make their way towards river mouths to spawn. Get out and enjoy August’s hot days and hopefully hot bites!